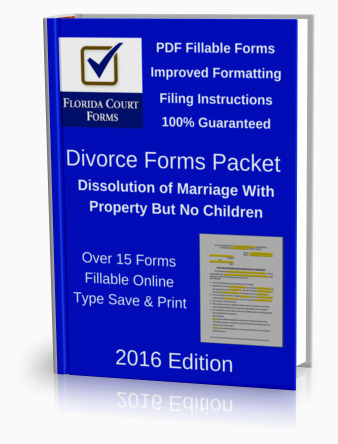 Dissolution of Marriage in Florida: The state court publishes four official petitions for divorce. Choosing which one is right for you is really a simple matter once you know the differences between them. By comparing the eligibility requirements for each of the forms, you will be able to choose the right one for you. Once you determine which form you will be using, read our popular instructions page for that form. This form should be used when a husband and wife are filing for a simplified dissolution of marriage. Who can file for the Simplified Dissolution of Marriage? • You and your spouse agree that the marriage cannot be saved. • You and your spouse have no minor or dependent child(ren) together and the wife is not now pregnant. • You and your spouse have worked out how the two of you will divide the things that you both own (your assets) and who will pay what part of the money you both owe (your liabilities), and you are both satisfied with this division. • You are not seeking support (alimony) from your spouse, and vice versa. • Neither you nor your spouse wish to have any financial information other than that provided in the financial affidavits. • You are willing to give up your right to trial and appeal. • You and your spouse are both willing to go into the clerk’s office to sign the petition (not necessarily together). • You and your spouse are both willing to go to the final hearing (at the same time). If you do not meet the criteria above, you may be able to file a regular petition for dissolution of marriage instead. This form should be used when a husband or wife is filing for a dissolution of marriage and you and your spouse have dependent or minor children together or the wife is pregnant. You and/or your spouse must have lived in Florida for at least 6 months before filing for a dissolution in Florida. • You and your spouse have a dependent or minor child(ren) together or the wife is pregnant. This form may be used when a husband or wife is filing for a dissolution of marriage, and the husband and wife have marital assets and/or marital liabilities but they do not have any dependent children nor is the wife is now pregnant. If you and your spouse agree on all issues and both can attend the hearing, you may want to file a Florida simplified dissolution of marriage petition, Florida Family Law Rules of Procedure Form 12.901(a). • You disagree about property, debts, or other matters and wish to have a judge settle them for you. • Either you or your spouse is seeking support (alimony). • You would like to ask questions and get documents concerning your spouse’s income, expenses, assets, debts, or other matters before having a trial or settlement. • You would like to reserve your rights to have any matters reconsidered or appeal the judge’s decision. This form may be used when a husband or wife is filing for a Florida dissolution of marriage, and the husband and wife have no marital assets and/or marital liabilities and they do not have any dependent children nor is the wife is now pregnant. You and/or your spouse must have lived in Florida for at least 6 months before filing for a Florida dissolution of marriage. • You have no marital assets or marital debts. • Neither you nor your spouse is seeking support (alimony).